Those have also been named in honor of major Met supporters, including the Lizzie and Jonathan Tisch Gallery and the Carl and Iris Barrel Apfel Gallery. But we all know who really runs the show around those parts. 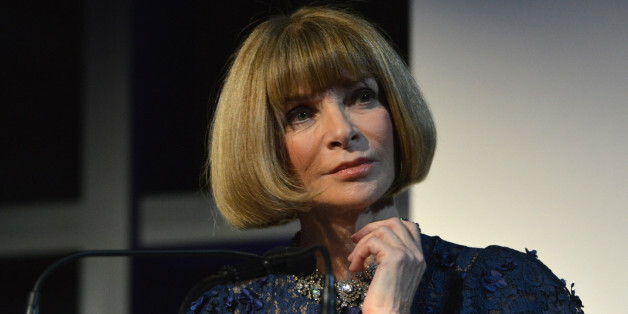 Wintour has been a highly visible supporter of the Met's fashion wing for years, most famously through her annual fundraising blowout, the Met Gala. (WWD reports her efforts have raised about $125 million for The Costume Institute over the past 20 years.) The gala has become the most anticipated and well-attended social event of the year in New York City, jokingly called "the Oscars of fashion" (but let's be honest, the Met Gala has an even better guest list -- think the Oscars' celebs plus every designer and model in the biz). Now Anna's imprint will be even more prominent. The Met's director and chief executive officer, Thomas Campbell, tells WWD, "When you walk into The Costume Institute... you will see 'Anna Wintour Costume Center' in bold, bold letters above the staircase." You can see the big change come May 8, when the Costume Institute's annual exhibit is unveiled. The theme this year is "Charles James: Beyond Fashion" -- but we have a feeling Charles James might be a little overshadowed by a slightly more famous industry name.